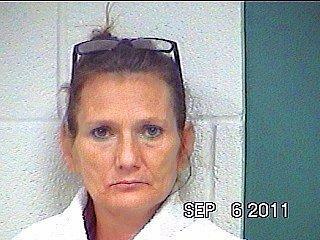 49 year old Wendy Sitzmore of Livingston went from being charged with a misdemeanor to 3 felonies in one fell swoop. Stupid Criminal Tricks, Shoplifter Charged With Robbery, LIVINGSTON, September 7, 2011 - At approximately 2:08 pm on September 6, 2011, a call was placed to the Livingston Police Department to report a shoplifter who became physically hostile. Officers Chad Ward and Kevin Ward with the Livingston Police Department were dispatched to CVS Pharmacy in Livingston where the incident occurred. According to employees at CVS, when a clerk approached the shoplifter, the shoplifter became physically forceful with the clerk and assaulted the clerk with her hands. Officer Chad Ward investigated and was informed of the incident. Two females entered the pharmacy and one of them allegedly began shoplifting. When approached by a pharmacy employee, one of the females (Wendy J. Sitzmore, 49, of Livingston) physically attacked the pharmacy employee. The two then left the store, Wendy Sitzmore had merchandise. Sitzmore fled in her friend's minivan leaving her friend to fend for herself. Officer Kevin Ward caught up with the stranded female walking westward on US-190 West in front of Wal-Mart. She told Ward that her friend took off in her minivan without her approval and that she wished to file charges on Sitzmore for auto theft. In the meantime, Sergeant Ronnie Bogany with the Livingston Police Department caught up with Siztmore at R.B. Lake Grocery off FM-2457. Bogany spotted the minivan in the parking lot. As Bogany approached the vehicle, Sitzmore put the vehicle in reverse and backed into another vehicle in the parking lot. She then put the vehicle into drive and drove straight at Bogany. By now, Sergeant Bogany had his .357 magnum drawn. Bogany stepped out of the path of the oncoming vehicle and in one motion, yanked the door open, put the vehicle in park, and pulled Sitzmore out of the vehicle, to the ground and put subdued her with handcuffs. As things panned out, Officers with LPD and management from Livingston Taco Bell found stolen merchandise in the bushes at the parking lot of Taco Bell. Sitzmore tried to ditch the merchandise as she fled in the stolen vehicle and was spotted by management from Taco Bell. Sitzmore was also in possession of dangerous drugs. Wendy J. Sitzmore was booked into Polk County Jail and charged with robbery, auto theft, and possession of dangerous drugs (all three felonies). Sitzmore could be facing additional charges. Shoplifting is actually a misdemeanor, but her physical attack on the store clerk at CVS upped the charge to robbery (a felony). She then left her friend stranded when she fled in her friend's vehicle (auto theft is a felony), and possession of dangerous drugs is a felony. Sitzmore's friend was not arrested, nor charged with any offense.